Students from University of Pennsylvania, Rochester Institute of Technology (RIT), Vanderbilt University, and Northeastern University came home from college over the winter break, and volunteered to sit on our first College Panel on Tuesday, Dec 26th 2017. This public event took place at the Plainsboro Public Library in New Jersey from 1-2pm. Oliver Chiriac, the president of the National Student Council, moderated the discussion and high school students and parents asked questions to compare and evaluate student experiences at these colleges. The event was extremely well received, so stay tuned as we will be planning more of these in the future! SMILE.Amazon.com - Partnership with Amazon.com Inc.
AmazonSmile is the same Amazon you know (same products, same prices, same service), but on top of that Amazon will donate 0.5% of the price of your eligible AmazonSmile purchases to HAS Today. More details on how AmazonSmile works. Bookmark and do you Amazon shopping using this direct link: https://SMILE.amazon.com/ch/81-2428224 and ask your family and friends to do the same. Or, click on the banner above! On March 1st, 2017, at the West Windsor-Plainsboro High School South, a Volunteer Fair was organized by the PTA communities. 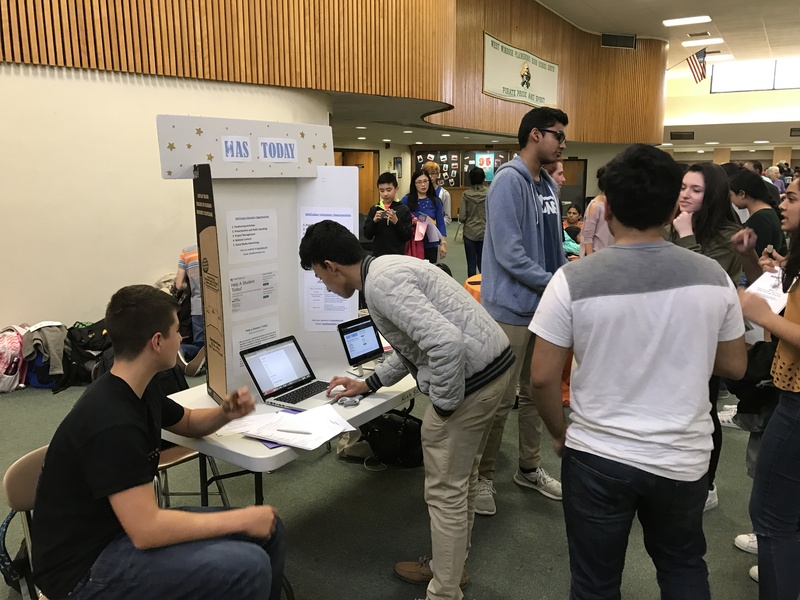 Organizations from all over New Jersey came, and students from both High Schools in the district, North and South, showed keen interest in volunteering to benefit the community. The HAS Today National Student Council, together with the WW-P Student Chapter saw this as a great opportunity to encourage students to volunteer with us. They set up a welcoming poster and created a Google Signup page. We appealed to over 85 students, who gave us their contact information to be volunteers for our non-profit. We have contacted them after the event, and will continue to be in touch when there is an opportunity available for them. The Hastoday volunteer opportunities include fundraising activities, presentations and public speaking, project management, website content, and social media advertising. We hope that this event has made more people in our community aware of who we are, what we do, and what they can do to help! A couple months into my Computer Art and Design course taught by Mr. Robert Vogt, I had the idea of asking him to start a project to create potential logos for 'my' non-profit company: HASToday. After discussing the idea with Mr. Vogt, he decided that it would be an awesome project for his students because it was a real-life scenario where a company needed them to design their logo. But, he told me that he’d have to ask the principal for permission because it is not a part of the class curriculum. Thankfully, with the help of Dr. Jonathan Dauber, we were able to begin working before the end of 2016. After several weeks of hard work and creativity, every student, including myself, created as many amazing logos as they could think of. In the end, each student selected their best logo to be sent to the Board of Directors of HASToday, who would vote for their favorite design. It was a long process because there were over 50 logos that each board member would have to assess. However, after a couple weeks a final decision was made. The logo with the highest number of votes belonged to Jesse Smith, the helping hands into the ‘H’.